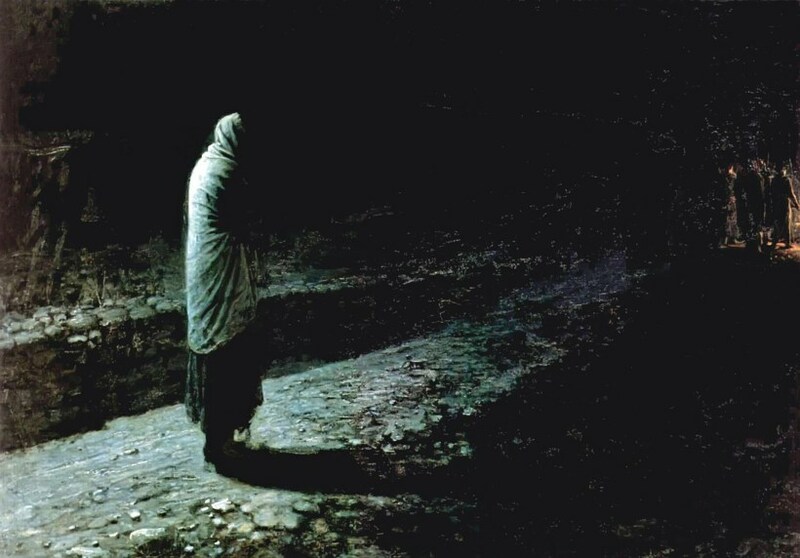 Nikolai Ge’s 1891 painting Conscience, Judas shows us a more layered Judas, here grasping his cloak tight around him, the darkness closing him, the light of Jesus being led away shrinking in the distance, the weight of his betrayal sinking in. Treachery has left its mark on all involved. The betrayed as well as the betrayer. Jesus as well as Judas. Here, alone in the dark, Judas finds himself — as I so often find myself — betraying that which he was meant to love. We, as Christians go with Jesus to the cross. Yet, we as Christians, too, stay with Judas in the garden as the dark closes in, mourning our betrayals. With the imagery of Judas, being a thief while he was with our Lord and the Apostles, stealing from them, I can’t help but ponder now, the Good Thief and the Bad Thief, crucified alongside our Lord. The Good Thief being the Apostles who did repent and turn back to our Lord, and Judas, having the time and being given everything he could to turn back to our Lord, being the bad thief and not changing, not taking advantage of the grace he was given to repent in the presence of our Lord. For someone to hang himself for what he had done, I do know he was a troubled soul with a conscience that would not allow him to rest, who was unable to face life anymore, who was unable to go to the Apostles to seek forgiveness from his brothers because of one simple thing. Pride. The rest of the Apostles were just as guilty of other sins, but did not take their own lives. They repented. They held their ground and asked for forgiveness. I don’t like to think about Judas as I am sure not many do like to think about him. We all hate to come to the realization that we all have a little Judas in us at some time, that truly needs to be purged and replaced with grace and mercy. be with those who are betrayed and slandered and falsely accused. be with families which are torn apart by mistrust or temptation. God continued to give him actual grace so that he regretted his sin and threw the money back. But. He proceeded away from the grace again into not trusting in God’s foregiveness. Both John Paul II in “Crossing the Threshold of Hope” and Benedict in an address opined that we could not be certain that Judas was in hell. Both Augustine and Chrysostom said he was in hell because they knew that Christ… not a Church document… made it crystal clear in His words about Judas…all dark as night and only appropriate to a not saved person. The Church has never declared on him because She declares on macro issues and only when they are disputed by many. Christ in prayer to His Father said, ” Those whom thou gavest me I guarded and not one of them perished but the son of perdition”. That was said in the past tense prior to Judas’ final sin and prior to the actual handing over of your art work. Past tense prophecy according to Justin Martyr is unconditional…it will happen. Future tense prophecy like Jonah saying Nineveh would be destroyed is conditional and thus Nineveh repented and stopped the destruction. Christ used past tense prophecy as to Judas…not out of rancor but out of forekowledge.